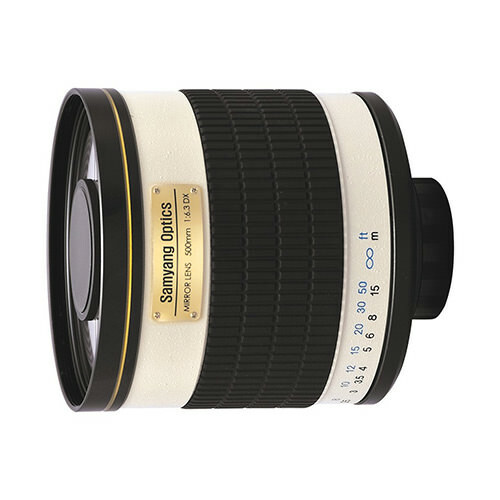 Lens Description: The white 500mm f/6.3 Mirror Lens from Samyang is a practical addition to any sports or nature photographer\'s camera bag. It\'s lightweight and ultra compact and it focuses as close as 6.1\' (1.86m). The aperture is fixed at f/6.3. This manual focus lens is constructed from fully multi-coated low-dispersion ED optical glass, with a 95mm front filter thread. A T-ring adapter (available separately) is required to mount this lens to a camera body. This lens is a budget-friendly way to introduce yourself to ultra-telephoto photography.